Envie de + 33: Light’Ears to be sold online and more! At the turn of the season Disneyland Paris annual passholders receive a little package through their door from the park. 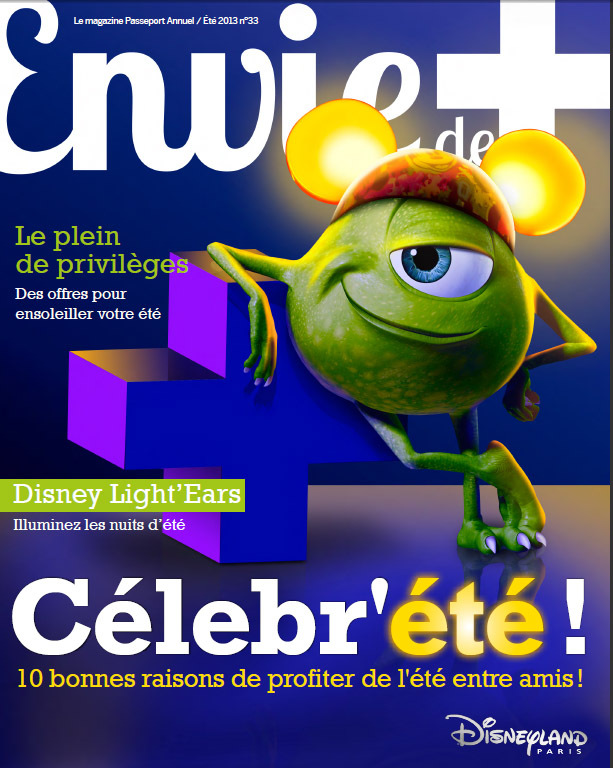 We get this little magazine (totally in French) called Envie de +, this is essentially a promotional magazine for the parks, giving their passholders reasons to come back and spend some time in the parks (We need a reason?!). The summer edition is of course focused on making the most of the remainder of the 20th anniversary celebrations, and discovering the big new addition of the summer Disney’s Light’Ears. The magazine gives annual passholders hints and tips to make the most of a day in the parks (such as reminding them that they may also partake in the Extra Magic Hours). Most of the information is promotional, but we do occasionally learn something about the goings on in the resort. (The Halloween and Christmas editions are particularly good for this). So, let’s get into the little discoveries. Disney Light’Ears sont en vente à la boutique Emporium, dans une sélection de boutiques au prix public de 20€ (l’avantage permanent Passeport Annuels’applique) ainsi que sur DisneyStore.fr. We already know that the Light’Ears are on sale on Main Street for €20, and annual pass reductions apply (10% for Francilien and Fantasy, 20% for Dream). But the big news is one that Disneyland Paris fans had hoped for, that Light’Ears will be made available online! The magazine being French based lists disneystore.fr but seeing as the stock on the European Disney Store websites are identical and are based out of a United Kingdom warehouse, we can assume that the Ears will make their way to Disneystore.co.uk and Disneystore.de ! Great news if you want to buy them in your own currency before you go and save some money for more holiday goodies! Whilst not exactly ‘news’ the magazine has a little bit of text about the ‘Snow White Tempation’ that we can experience in the California Grill restaurant in the Disneyland Hotel. The treat is an apple mousse with a chocolate centre, but no ordinary chocolate! We won’t spoil the surprise for you, but why not give it a try next time you are at the parks? The Disneyland Paris annual pass is THE way to save money in the resort. Since the magazine and all Annual Pass literature is in French, we’ve translated the summer offers for you. Buffalo Bill’s Wild West Show with Mickey and Friends: Between the 1st July and the 8th September, a reduction of 50% is given in category 2 of the 21h30 show for the passholder and 5 guests. (€29.90 per adult instead of €59.90 and €23.40 per child instead of €46.90). Reservation at the ticket office or by telephone 01 60 45 71 00 (Don’t forget to add the French calling code, which is +33). Panoramagique: This summer discover Disneyland Paris from the Sky with upto 25% off! -25% for Dream Annual Passport, so €9 per adult instead of €12 and €4.50 per child instead of €6. -15% for Francilien, Fantasy, Découverte and Classic Annual Passport. €10.20 per adult instead of €12, and €5.10 for a child instead of €6. Offer valid for the annual pass holder and up to 5 guests from the 1st July until the 30th July 2013. As usual, Panoramagique’s opening is subject to weather conditions. Boutiques: -10% for Francilien and Fantasy, -20% for Dream in all boutiques in Disneyland Paris. Restaurants: -€0.50 from the VitaminWater drinks at the HepCat corner kiosk, this offer is valid all summer. €3.19 per bottle instead of €3.69. -10% in all Disney park, Disney Hotel and a selection of restaurants in Disney Village. €25 for friends of Découverte and Classic pass holders. (5 friends per week, maximum of 20 friends during the offer period, a week is Monday-Sunday. Offer not valid the day of purchase of your annual passport. Offer does not include the 13th July). All the offers listed about are subject to terms and conditions which can be found in your copy of Envie de +, this is a English translated guide and does not substitute reading the offer conditions as distributed to all annual passholders and available on the Disneyland Paris website. The Disneyland Paris summer has begun, all that’s missing is you! PreviousPrevious post:Coup de Cœur #1 – Front LotNextNext post:Pin Trading: Indiana Jones Event pins!